Nanoparticles are tiny structures, typically less than 100 nanometers in size, which is about 500 to 1000 times smaller than the thickness of a human hair. Such materials are receiving increasing attention for biomedical applications. If equipped with appropriate properties, they can reach almost any tissue in the human body via the bloodstream—turning into perfect body probes. It has been known for some years that the distribution of nanoparticles in the body is essentially determined by their size and surface properties. Dr. Tanmaya Joshi at HZDR's Institute for Radiopharmaceutical Cancer Research says, "Upconverting nanomaterials are of great interest for biomedical imaging." "When stimulated with infrared light they can send out bright blue, green, or red signals. If we succeed in navigating such nano-probes to diseased tissues, it can be particularly useful for cancer diagnosis," the team's photochemist, Dr. Massimo Sgarzi, added. However, these light upconverters show poor solubility in water or tissue fluids—a must-have feature before any diagnostic or therapeutic use could be imagined. For the HZDR team this was not a hindrance, but rather a challenge: "We used a unique polymer mixture to cover the particles," says Dr. Joshi, who joined HZDR in 2017 from Monash University, as a Humboldt Fellow. 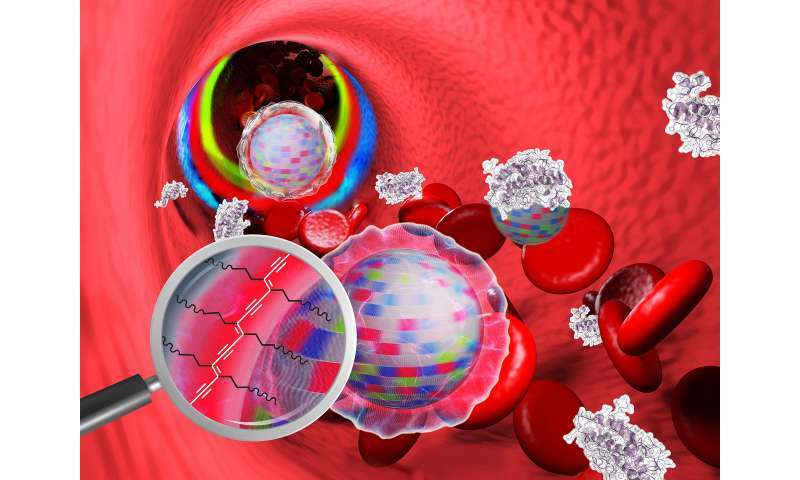 Adding this protective cover makes the light-transducing nanoparticles biocompatible. The biologist Dr. Kristof Zarschler adds: "The upconverters are now water-soluble and even have a neutral surface charge. Our research shows that this new cover can almost completely prevent the body's own substances (present in the blood serum) from binding to the particles. In other words, the nanoparticles now seem to wear an invisibility cloak. This, we believe, will help to avoid their recognition and elimination by phagocytes of the immune system." In order to keep the new nano-probes stable for weeks in a complex biological environment, the scientists photochemically link the components of the protective shell with each other: "We simply irradiated our nanoparticles with UV light. This creates additional bonds between the molecular components constituting the protective cover—much alike sewing together the individual parts of the cloak of invisibility with the help of light, "explains the Ph.D. student, Anne Nsubuga. She further adds, "This shell is only a few nanometers thick, and may even be used for hiding other substances, for example, cancer drugs, which could be later on released in the tumour and destroy it." Following this breakthrough, the team now intends to validate their current results in living organisms: "For this, we first have to carry out strictly regulated and ethically acceptable experiments on animals. Only when our stealth-cap technology works on these without any side effects, their medical potential will be explored in detail and their application on the patients can be considered," explains the group leader Dr. Holger Stephan cautiously.